Swansea has the highest death rate from opioids in England and Wales, new figures reveal. Prescription levels of powerful painkillers rose by 30% during the period 2007 to 2017. The rise is mirrored by soaring numbers of overdoses and deaths, according to research by The Sunday Times. In Swansea in 2017, 16 people per 100,000 died from opioids, according to the Office for National Statistics (ONS). 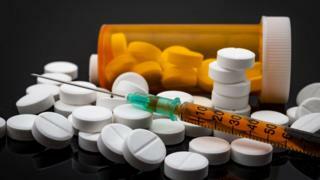 There were 40 opioid-related deaths out of a population of 245,480. In 2017, the most recent year for which data is available, the death rate per 100,000 in Wales was more than double that of London. Only the north-east of England had a worse rate. About 2,000 fatalities each year - more than five every day - are down to the painkillers, up by 41% from 10 years ago. They includes deaths from heroin, another opioid. Four in five people who try heroin began with prescription painkillers. The number of people hospitalised after overdosing on opioids has almost doubled in the past decade to 11,500 cases. Dr Andrew Green, the British Medical Association's GP committee clinical and prescribing head, said he was shocked by the findings and warned "immediate action" was needed to tackle the crisis. Part of the blame has been directed at GPs who are handing out the vast majority of the 113,000 opioid prescriptions dispensed every day, according to NHS data. Eytan Alexander, chief executive of UK Addiction Treatment, said: "GPs must accept responsibility for consistently overprescribing. "A rate of 79 packs per minute is just not acceptable. It is vital that alternatives are provided." The drugs can be useful to relieve pain for a few days, for instance after an accident or surgery. However, there is not only a black market in pills that were first prescribed by GPs, but drug dealers are now bulk buying opioids from China, the Sunday Times has found. Prof Helen Stokes-Lampard, chairwoman of the Royal College of General Practitioners, said: "The mantra is to prescribe opioids at the lowest possible doses for the shortest possible time." She added that family doctors "will discuss the risks and benefits of opioids with the patient, including the potential for addiction" as well as carefully monitoring patients on such medication.